I did not think duck botulism treatment would be part of my summer. I spent the later part of the summer performing various duck botulism treatment options so my Rouen hen could recover. 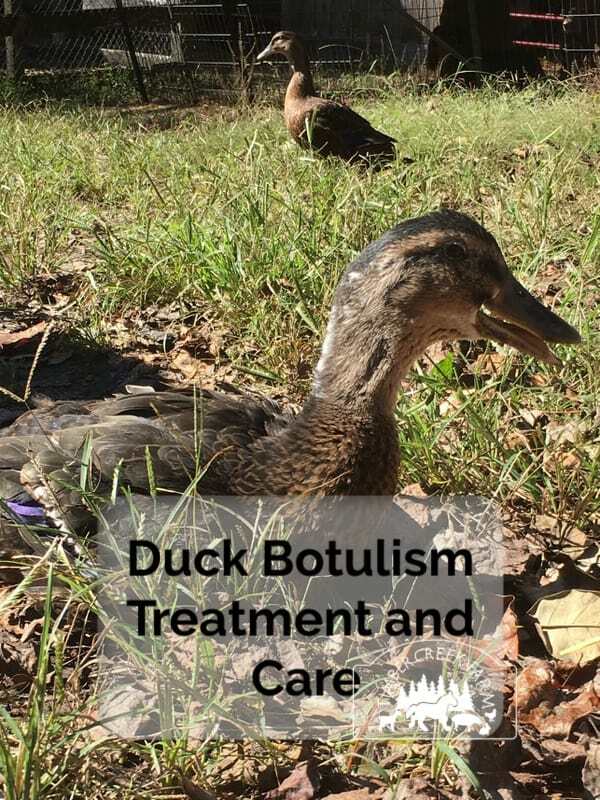 Since I had not heard about duck botulism or duck botulism treatment, it was not my first thought when I found Gretyl sitting on the nest for an extended period of time. At first I left her, thinking she just needed extra time and would eventually lay her egg. Later, I picked her up and found her to be quite floppy. I thought she was hurt. My first thought was the Drake was too rough with her. I cared for her, cleaned her up and put her in a safe spot with food and fresh water. Gretyl took a drink but was mostly disinterested in anything. I did not think her prognosis was very good. I was surprised she survived to the next morning. And continued to survive. Gretyl couldn’t move. She tried but her body was limp and paralyzed. When I picked her up she would release a large amount of diarrhea. While her neck wasn’t twisted, it was being held at an odd position. She could not preen or reach her oil glands. After I would help her get a bath, I needed to dry her with a towel because she had no oil on her feathers anymore and was quite wet and chilled. If the food was placed right in front of her, she would eat and drink water. Not knowing what was going on that first day, I treated her symptoms and tried to keep her dry, clean and comfortable. It was warm weather so unless she was wet, I didn’t need to worry about her getting chilled. I searched on line for her symptoms. The symptoms closely matched the effects from avian botulism toxin. The toxin produced from botulism causes paralysis in the wings, legs, third eyelid, neck and more. The duck will be floppy when picked up and may have diarrhea from the toxins. The twisting in the neck can be mild or severe. When the neck paralysis is severe the duck often dies from drowning. 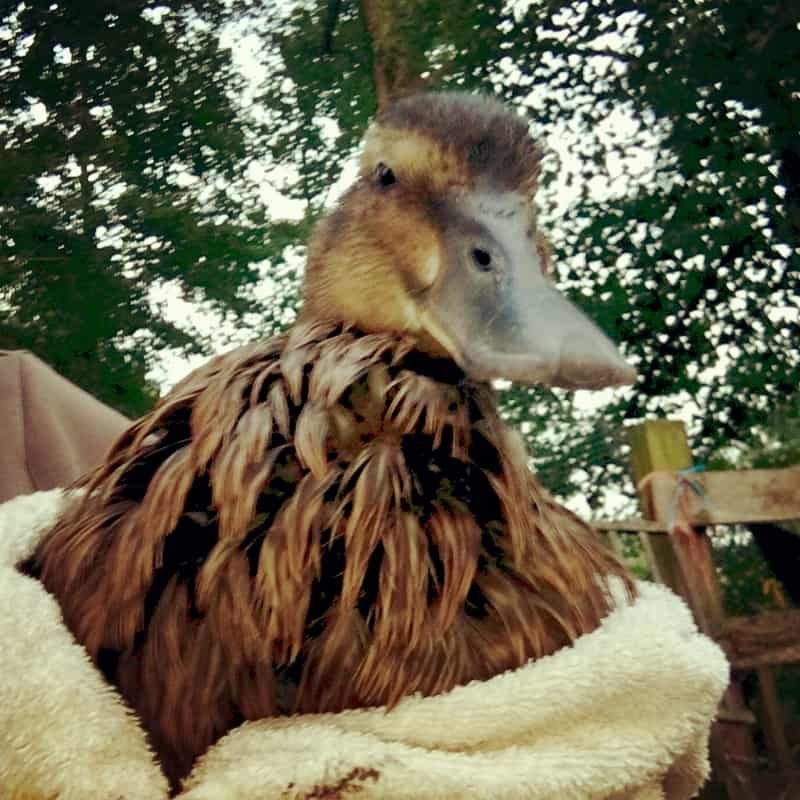 I started a progress record and made notes about the duck botulism treatment we gave Gretyl. Slowly she began to regain some body functions and strength. Once or twice a day I would help her get clean in a small pool of water. She couldn’t be left alone as she still leaned far to the right and had no strength to sit upright in the water. After drying her off with a towel, I would move her legs and try to hold her up to stand. Gradually, she would stand for a few seconds. The standing time gradually increased. Duck Botulism is also known as Limberneck because of the way the neck muscles contract and bend. The duck’s neck can be held bent and rigid or be very limp. In Gretyl’s case, it was good that she had a more rigid neck because she could eat and drink if the bowls were positioned just right. It was necessary to clean her nostrils if they became blocked since she wasn’t bobbing her head in water. Her eyes also became crusty because she wasn’t cleaning her face in the water. We used a colloidal silver solution, at a few drops, twice a day, alternating with Veterycin Antiseptic Eye Gel. Eventually Gretyl’s eyes stayed clear and moist without the drops. What Causes Botulism Illness in Ducks? The Clostridium Botulinum toxin , types C and E, blocks the nerves in the victim and leads to respiratory and muscle paralysis. Ducks, along with other avian species can ingest the toxin or eat some intermediate host such as the fly larvae and maggots. In addition, spoiled food, and dying (decomposing) plants can harbor botulism toxin. Botulism bacteria need warm temperatures, protein (the invertebrate host), and lack of oxygen (anaerobic) to produce the toxin that leads to illness. The larvae or other host does not die from the toxin. The duck can get sick after eating just a few larvae. While unsanitary conditions can be the perfect setting for growing C. Botulinum, certain other conditions can also be hospitable to an outbreak. Standing, stagnant water, and an over population of flies in the wet conditions can also be the right setting. And yes, ducks love any water, so that can be a challenge during rainy weather. When you have ducks free ranging it can be hard to monitor all the areas they visit. This past summer was very wet, humid, and steamy hot. It was difficult to keep the pens dry and fly blooms were common, despite our best efforts. Of course it could also have been found in rotting, decomposing plants as not all plants thrive in wet conditions. As ducks roam and forage they can come in contact with the toxin. Progress report on Gretyl. This week is not as encouraging because I have to look harder for the progress. But it is there. And she’s gotten really good at projectile pooping on me when i pick her up. She’s able to sit up straight now without listing to one side like the photos from a couple days back. During therapy, both feet have some strength although the left is less than the right. She eats well and drinks a lot. Is Botulism Contagious to Humans and Other Animals? The type of botulism toxin that affects birds is species specific and does not affect humans. However, once you have sick bird from botulism toxicity, cleanliness is extremely important or others may get sick too. The duck should be moved to a dry, draft free location. Give food and water and clean up any food spills promptly. Wipe the eyes and bill clean, especially if the duck cannot dunk it’s head to get clean. Clean up the area, removing any feces, spoiled or spilled food, and stagnant water. If you don’t do this, you risk further cases of duck botulism in your flock. Sometimes, botulism toxin enters a wound. This may require veterinary treatment and even surgery. Helping a duck recover from botulism toxin illness was not a simple process. Many body systems were affected that required special care. We used a child’s wading pool for strengthening Gretyl’s legs. At first, we had to watch her closely in the water because she would flop over to one side. She couldn’t make a lot of noise so we could have easily missed her drowning in the shallow water. It seemed that paddling in the water was easier than trying to walk because the water floated her body, allowing the legs to move freely. Lack of food and drinking water can cause death, after an infection with the toxin. Gretyl could not move at all the first couple of weeks so food and water had to be placed near her. 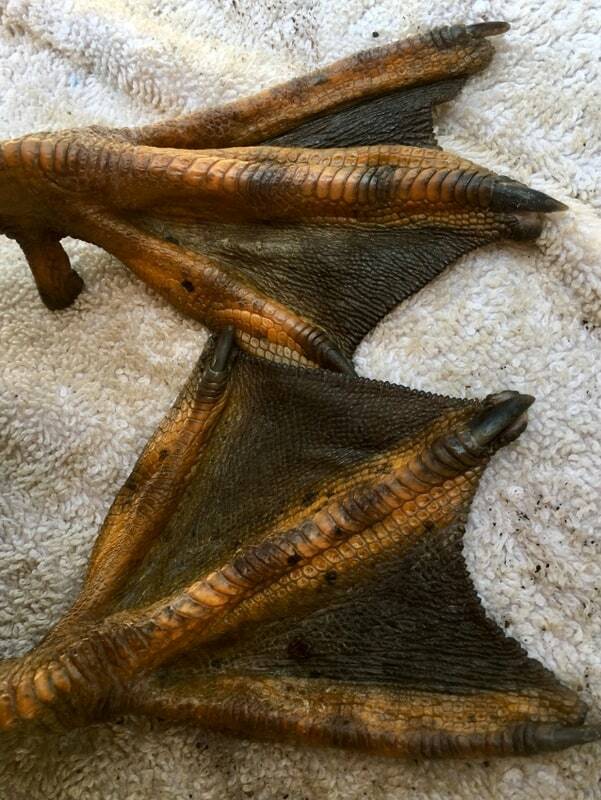 Predators would have an easy meal with a duck suffering from Botulism toxin illness. Domestic ducks don’t fly well anyway, and when sick with botulism, they can’t run for cover either. In severe cases, death from respiratory failure is a possibility. While an antitoxin does exist, it is not readily available to many. Veterinarians may have it or they may have to order it from the Center for Disease Control. The antitoxin needs to be administered early in the course of the disease. Usually by the time you realize what you are dealing with, the duck is on the road to recovery, or has died. The best plan is to control the fly population, and take care of stagnant water sources. Parasitic wasps may be a good way to control fly populations. Also, have a good plan for manure handling. We use both diatomaceous earth and animal safe lime products to help control flies and keep our coops and stalls sanitary. The following notes are the last two entries in my record of duck botulism treatment. Gretyl’s recovery was completely textbook progress. The length of her recovery seems to be longer, although she can eat and drink, and does attempt to keep up with Milo and her new housemate LuLu. Gretyl is still making progress in her recovery from botulism toxin. Her neck has loosened up quite a bit. She can take several steps on her feet before returning to scooting on her belly. Milo is a perfect companion. I was so glad to see her bob her head under water normally although she wouldn’t do it on the video. Still making progress! Gretyl continues to make baby steps of progress. I wonder sometimes if she will ever make a full recovery. 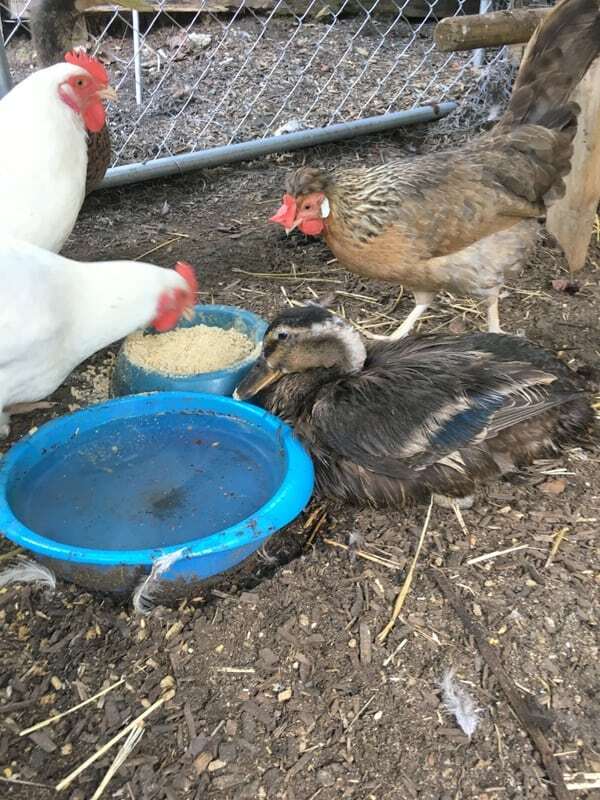 Recently, a duck needed to be re-homed and we added LuLu to our farm. She fit in nicely with Milo and Gretyl and the three of them have bonded well. Even though Gretyl cannot keep up with them during free range, I do see them circle back to check on her and call to her while they run about the open area. Duck botulism and the resulting illness from the toxin took us by surprise. 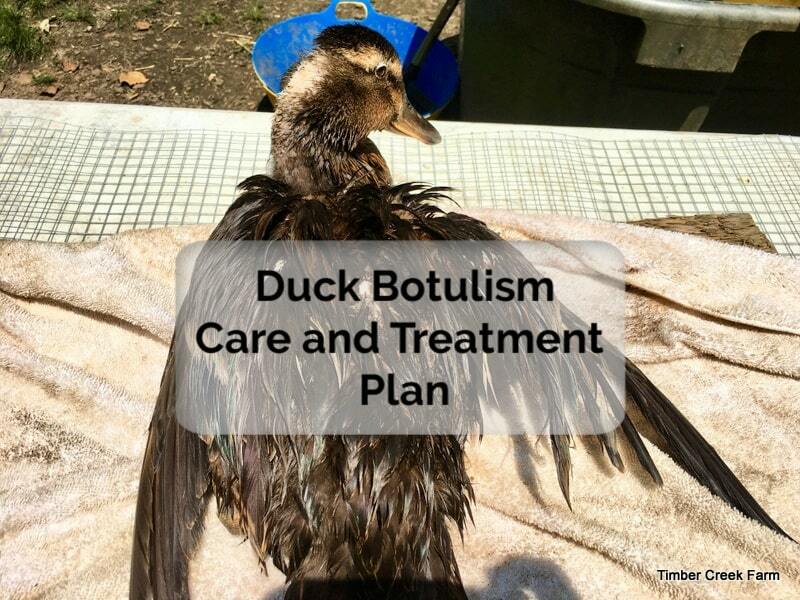 It could happen to anyone and I hope that this duck botulism treatment plan can help someone else’s duck to a full recovery. 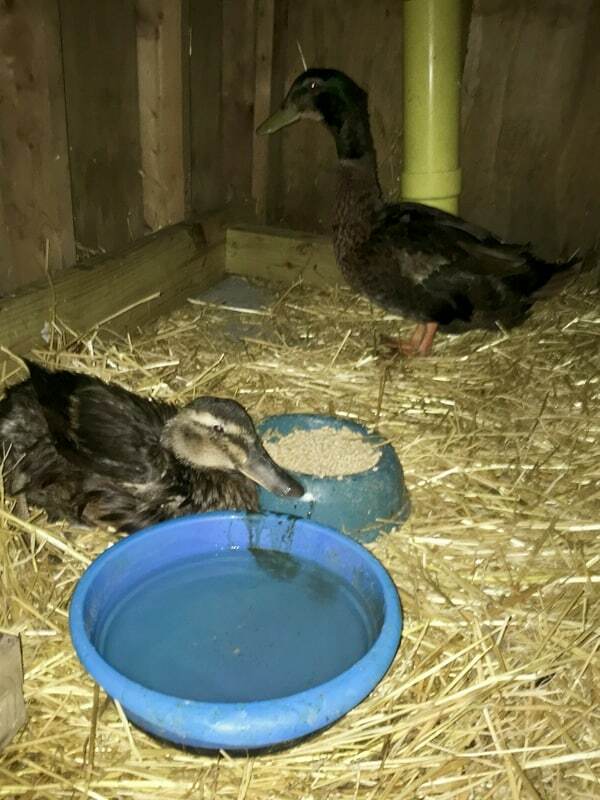 Another duck ailment occurred in my friend Laurie’s flock. One of their much loved pet runner ducks developed ascites or water belly. Once a death sentence, we now know that there are measures that can be taken to relieve the pressure and often put the duck on the road to a full recovery. 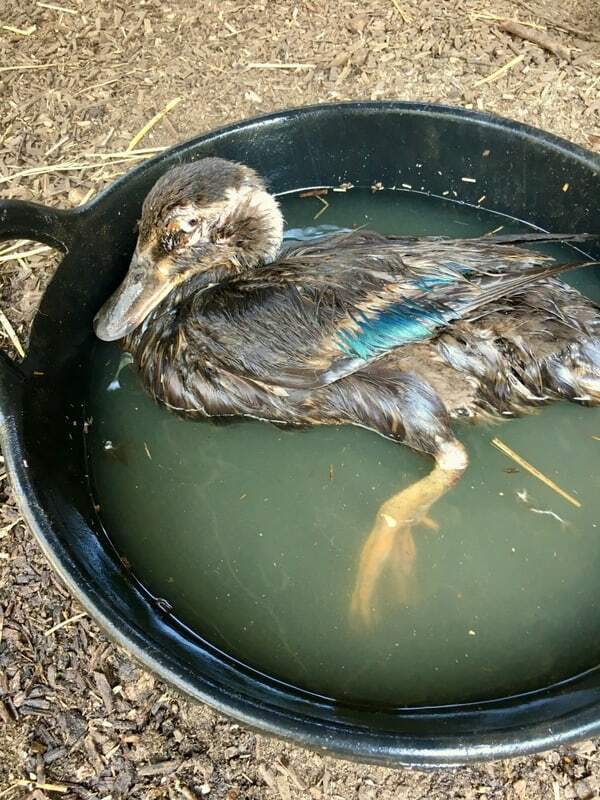 Read more about Ascites in ducks here.